The second book in the Trilogy was awesome!!! Sage/Jaron has been accepted as the long lost prince and has become the King of Carthya. Jaron is not out of the woods yet because there are still those (the pirates, Devlin and even some of the regents in his court) who want him out and replaced with a steward until he reaches the proper age. As we all know what Jaron is capable of; he listens to no one and sets out to kill the pirates so that there will be no war in his kingdom. Jaron will not listen to Mott, Imogen, or Tobias. He is convinced he must do it alone. Once again Nielsen's plot is filled with suspense, deceit, and Jaron's wit, mind, and heart realize too late he will not be able to accomplish this on his own. He fools the pirates into making him a pirate and he is branded with a hot iron. Jaron's anger and hatred continually push him forward with his agenda but with catastrophic effects when the pirates find out who he really is. Hold onto your heart; it is going to be palpatating overtime with the Runaway King. New chracters are introduced and where the pirates live, no one ever leaves!I can't wait for Book 3!!! 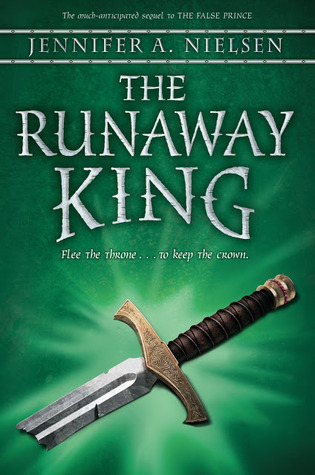 Sign into Goodreads to see if any of your friends have read The Runaway King.